We must stop allowing the devils of MSM dictate our language. The thousands of Hondurans and Guatemalans are NOT a “migrant caravan”. And as you can see from news videos and the pic below, like the Muslim invaders in Europe, the Central American invaders are mainly young, military-age men. According to Breitbart, the migrant caravan invaders originated in Honduras when about 1,300 “migrants” began an organized march to Mexico toward the U.S. border. Despite the Mexican government’s announcement it would enforce immigration laws and turn back those who do not have a visa, the “caravan” grew in size to more than 4,000. Yesterday, the migrants invaders broke through a flimsy border fence on Mexico’s southern border and swarmed into Mexico like locusts. Reuters reported yesterday that the border breach took place in the town of Tecun Uman at the Mexico-Guatemala border. The invading horde broke through the border fence “and onto a bridge leading to Mexico, only to be halted by dozens of Mexican police in riot gear.” Mexican police say “a few” officers were injured in clashes. Late yesterday, the governments of Honduras and Guatemala said they were mobilizing to assist the return of Honduran migrants to their homeland. Honduran President Juan Orlando Hernandez said he had spoken to his Guatemalan counterpart Jimmy Morales for clearance to send civil protection personnel to help the Hondurans and to find transport for those wanting to return. “We’ll continue this operation for as long as is necessary,” Hernandez said in a post on Twitter. Guatemala’s government tweeted that Hernandez would meet Morales today in Guatemala City to implement a strategy for returning the Honduran migrants. According to Reuters, Central American “emigrants” from Mexico, Guatemala and Honduras make up the bulk of people now caught trying to enter the United States illegally every year, and that “several migrants” (i.e., INVADERS) at the Guatemala-Mexico border spoke of entire neighborhoods leaving their homes to join the trek invasion after news circulated on social media of a call for a new “caravan” to Mexico six months after the previous one. Mr. President (@realDonaldTrump), the time for threatening words is over. It is time for action. Send a battalion of our military to the border to show Mexico-Guatemala-Honduras and the American people you mean what you say. This entry was posted in conspiracy, Donald Trump, Honduras-Guatemala 'caravan' invasion, illegal immigration, Insanity, invasion of illegals, Liberals/Democrats/Left, Military, MSM, United States, US Presidents, US-Mexico border wall and tagged Central American "migrant caravan", Guatemalan President Jimmy Morales, Honduran President Juan Orlando Hernandez, Mexican President Enrique Peña Nieto, Tecun Uman, Trump on border invasion. Bookmark the permalink. These poor impoverished people are adorned in more expensive clothing than I wear. As has been said, the majority of these invaders are army age young men. Whose women do you think they will be preying on if they arrive here? Wouldn’t you think that the Dems would be all up in arms over this fact, since we know how they “cherish the virtue of women.” Or, at least some Demorat women. So, by this standard, anyone wishing to invade those countries can? Any country with an army should be able to repel all invaders. Isn’t that the basic idea of having a military? They should meet them with concertina wire and .50 cal. machine guns. Soros and his gang of insurrectionists should be summarily arrested and sent to GITMO. This is an outrage designed to make Trump look bad at the election cycle. Nothing we do will be received well. So, forget all that and stop ’em cold, turn off the cash to the South and arrest the perpetrators. Please note the TIMING of this wave of invaders. They would be getting here very shortly before the mid-terms. What the leftist instigators and funders of this are hoping for is a strong response by President Trump that then offends the moderate dems and the #WalkAway crowd away from voting Republican. This has been PLANNED. Please God that it backfires hugely on all those who instigated this to try to harm this country. This has been planned and is happening, in part, because contraception and abortion has reached the point where the demographics themselves have changed, even without the invasion. And we can thank Ted Kennedy and Jacob Javits for the Immigration Act 0f 1965, also! this is being spun from every direction. don’t accept interpretations without verification. keep calm. use your reason. don’t be stampeded. this is an important battle. keep the focus. it is not immigration. it is an invasion. and vote if you value your freedom. help trump break the cult. Don’t worry, we all have something for them. 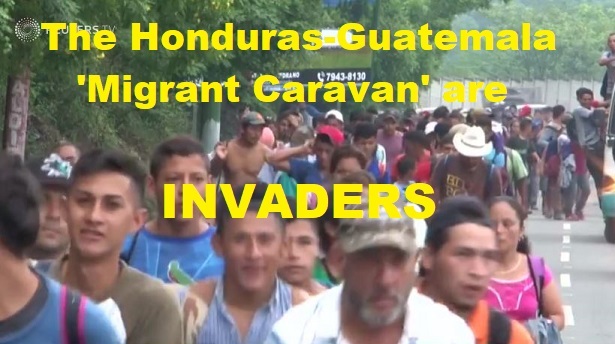 Just ask the Emperor why Japan didn’t invade the US mainland and instead opted to attack Pearl Harbor..
100 ISIS terrorists in migrant caravan – Judicial Watch.